Enter your travel date in the search box above to show the current ferry departure times and ferry ticket prices. You can also buy your ferry ticket online. The ferry between Ao Nang and Phuket operates all year. However in low season (May to October) the ferry may cancel trips due to the winds changing directions creating unpredictable large waves. In high season the ferry may be very crowded and an alternative would be to travel by road using the public minivans. Ao Nang is one of Thailand’s most popular beach destinations, thanks to its location only 40 minutes drive from Krabi Airport. See Ao Nang’s best places to eat, things to do and places to stay in our Ao Nang Quick Guide. The most popular beach destination in Thailand, Phuket is a big island with a lot of different beaches, each with its own character. Find out which part of Phuket is best for you with our Phuket Quick Guide. 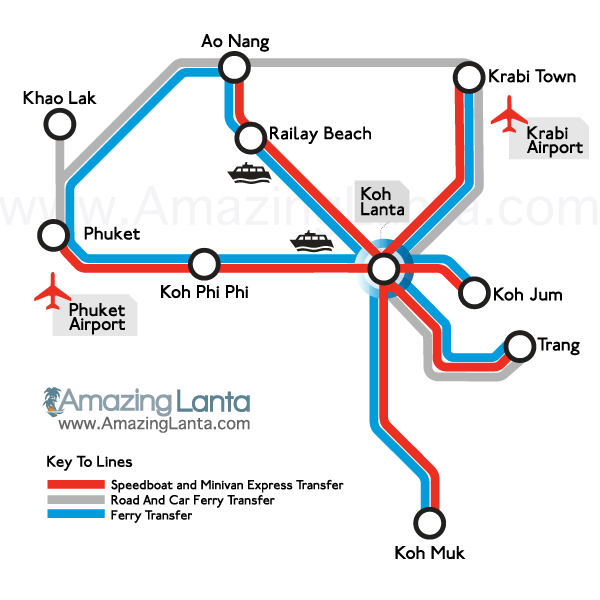 There are numerous ways to travel between the many destinations in Krabi, Phuket and Trang. See our route map to find out what options are available between different places.